In two years, Gee Lee and his brother will travel to California to work on Donner Summit, chiseling granite for railroad tunnels. 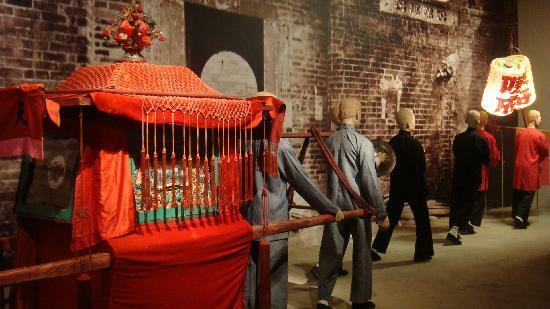 His sixteen-year-old bride arrived in a gold-painted sedan chair. Carried by her brothers, the conveyance bobbed behind honking geese, herded by children dressed in red silk. Breeze-ruffled curtains concealed all but her profile and rigid posture. Like a boy, Lee wished he could run down the lane, and pull back the cloth to see. But his upbringing would not allow him to dishonor the family. He remained in place, bland-faced, keeping his tumultuous emotions from showing. As the procession drew near, Lee expected the geese to be shoo’ed inside their animal pen. Instead, the children formed a circle around the birds, using bamboo poles to avoid vicious snaps. 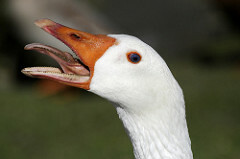 The gander stood at the center, feathers erect, beak open, hissing, tongue at full point. Dark eyes locked onto Lee, the enemy. Crossing his arms, Lee nodded. Secured around the messenger’s neck was a bright blue ribbon; a yellow purse dangled from it. This was the first test of the marriage ceremony. The wedding party expected Lee to refuse outright or walk through the flock, subjecting himself to injury. Lee took his time assessing, ignoring the sweat breaking out on his upper lip, as his exhilarating mating fantasies submerged under icy waters of responsibility. He strode forward, taking two bamboo rods from the children. Lee directed them to move away. Tapping and swinging them, Lee drove the geese into the pen, separating the messenger. Tossing the rods to the ground, Lee scooped a handful of pebbles while making a cautious advance. The gander raised its wings, lowered its head, and charged. Lee threw stones in the bird’s face, deflecting the charge, but not before the infuriated fowl clipped the tender flesh above Lee’s knee. It clamped on; its beak like crab pincers, tearing the fabric and skin. Refusing to yell, Lee grabbed the ribbon while kicking at the animal. The purse dropped, landing in the dirt as the gander waddled away, rejoining its gaggle. Lee stared at the scene feeling a vein thumping in his temple. Biting the inside of his cheek until he tasted blood, Lee willed himself to walk without limping, retrieving the purse. As he considered opening it, pitching it, or handing it over to his mother, a Confucian quote floated to the surface of his thoughts. When it is obvious that goals cannot be reached, don’t adjust the goals, adjust the action steps. Taking measured steps, Lee approached the sedan. After a thoughtful pause, he plunged his hand inside, offering the purse. As he waited, anger sparked into a blaze, threatening to incinerate the curtains. It would be within his right to humiliate her, make her kneel before him in the open air. When cool, trembling hands cupped his, Lee’s violent emotions plummeted. A shiver traveled down his spine. From inside, a breathless, “thank you,” came as the purse lifted away. With the return of Lee’s exhilarating fantasies, only the force of his will kept Lee from smiling. This scene is a writing sample I took to the 2019 Sierra Writers Conference to participate in a Critique Group facilitated by Dimitri Keriotis. Observations, comments, and/or feedback is welcome and encouraged.